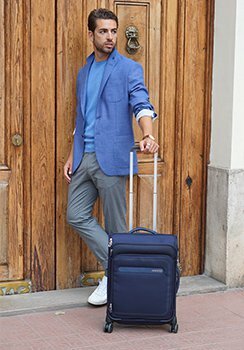 American Tourister is more than excited to be represented by football legend Cristiano Ronaldo! Dynamic, stylish and confident, CR7 embodies everything our brand values the most: youth, vibrance and fashion! Cristiano is a true legend of the game and one of today’s most popular and recognizable sport icons. The football hero is an avid traveler himself and brings back more from every trip: more memories, experiences and memorabilia. His Soundbox suitcase is his true companion in all his successes. And he shows it off! On his social media – which had more than 300 million followers throughout 2018! – our SoundBox suitcase is spotted next to his side. It’s his true travel companion wherever the games take him! Expandable in case you need to bring back more than you planned! In 2019, you can also look forward to lively new colours like Coral Red, Hot Pink, Jade Green, and Purple Orchid! Bring back more memories like Ronaldo and choose SoundBox! One final word from Cristiano Ronaldo: “I’m delighted to be American Tourister’s brand ambassador. 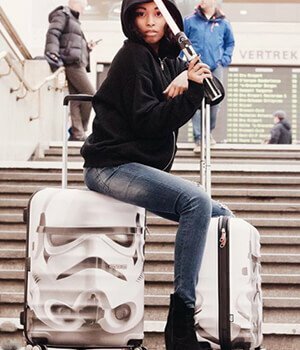 I love American Tourister, its innate energy and high quality suitcases make me able to express my personality”.